Sorry for the delay in posting, you will all understand if things got a little hectic around here. I am proud to say that we are now a party of five. Yes as in my mother has 4 kids ranging in age from 20 years to 20 months. 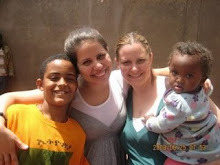 She and Jax left on monday march 16, got into Addis late late Tuesday night and picked up Eyerusalem on Wednesday. Let's just say that for all of you who have heard the horrors of toddler adoption, my mom's experience with Eyerus was that, times 13, but without any potty accidents. Incessant crying, screaming, refusing to make eye contact, attempts to escape, refusal to eat. She wouldn't let mom touch her, change her clothes, fix her hair, anything. She refused to sleep in bed with mom, and slept in a chair the whole trip, see picture below. As soon as Mom, Jax and Eyerus got home late Sunday night after 30+ hours of flight travel and 6+ hours of driving, she plopped right into my arms and fell asleep. Ouch for mom right? Well we all stayed home the next day and she slowly started coming out of her shell. Addis was like hey, who are you, why are you playing with my stuff now let's fight! Eyerus was like Hey, I hate all of you, leave me alone, give me a banana, and leave me alone. Things slowly got better, and she slowly started letting mom touch her more. I think she just bonded to me quicker because she wanted someone to have to love on, but was still mad at mom for being the person who actually took her from the orphanage. I stayed home with her on Tuesday, and she really started to show her personality. She had a few times where her "only childness" came out, but she quickly got over it and came back to loving on me. I don't have class until 2 on Wednesday so I stayed with her again, and she just really started to blossom. She was showing mom all types of affection and being really sweet and funny. She started day care on Thursday, please don't say anything about this affecting her bonding, we tried to hire a nanny and 3 fell through so she goes to the same one as Addis for half days and she told Jackson that she really likes it. She let's mom kiss and love on her now, she loves to have mom do her hair, and loves to cuddle up with me. She HATES the dogs, but is not as scared of them as she used to be. She has started to be really sweet with Addis, sharing her food, and drinks, and only fighting a little bit. That's all I have now, so I will show you all some much needed pictures. We only have a few, but we will take more this weekend. all happy and pretty in her embassy outfit, before she realized what was really going down. Has to be exactly like her big sister.